Cars will also be banned from turning right onto O’Connell Bridge from Bachelors Walk. 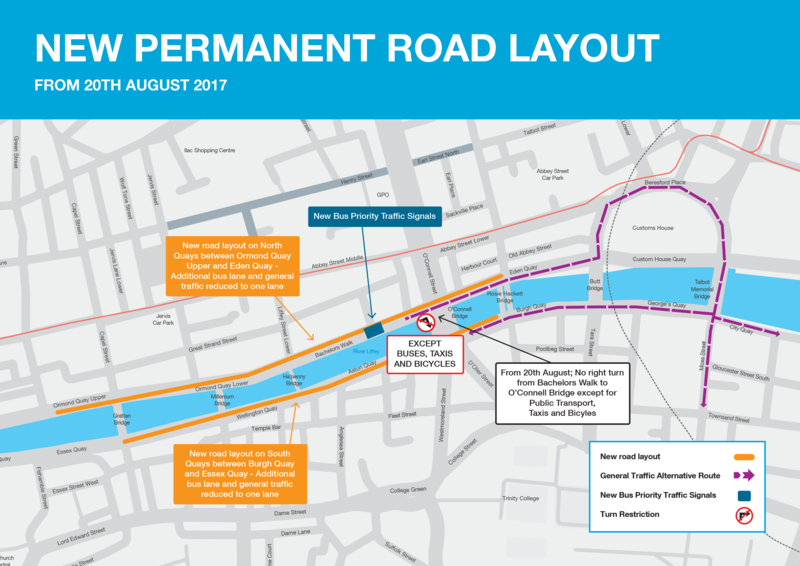 DUBLIN CITY COUNCIL (DCC) has confirmed that new traffic arrangements will come into effect on the north and south city centre quays from this Sunday. DCC said the changes are “being introduced to coincide with the Luas Cross City tram testing and to ensure that these permanent changes have time to bed down before regular day time tram testing starts in September”. From 10.15am on Sunday – following the road closure for the Ironman 70.3 event happening in the city – there will be no right turn for traffic from Bachelors Walk onto O’Connell Bridge – except for buses, taxis and bicycles. Also on the north quays, there will be a new road layout from Ormond Quay Upper to Eden Quay with additional bus lanes and general traffic reduced to one lane. DCC said new “bus priority traffic signals” on Bachelors Walk, approximately 100 metres before O’Connell Bridge, will control traffic flows and give priority to public transport. On the south quays, there will be a similar new road layout from Burgh Quay to Essex Quay, again with additional bus lanes and general traffic reduced to one lane. Brendan O’Brien, Head of Technical Services at DCC’s transport division, said the changes are part of an overall commitment by the council and the National Transport Authority (NTA) to improve mobility in the city and allow freer movement of public transport as Dublin expands and the number of commuters steadily rises. “The additional bus lanes will alleviate the difficulties faced by public transport on the quays, where the worst delays for buses in the city are experienced,” he said. At the peak morning time of 8am to 9am, over 7,000 people travel along the north quays on buses. This compares to around 500 cars and the same number of cyclists. DCC said these permanent traffic changes will lead to “an increase in the amount of people using public transport while still allowing access to the quays for general traffic”. Donal Keating, Head of Operations at Dublin Bus, said the company welcomes the new traffic arrangements. “The additional bus priority is important for public transport and highlights the importance of buses in tackling congestion in the city centre. “We carry 400,000 customers per day and these new traffic arrangements will ease traffic difficulties on the quays and help our customers avoid potential delays to their journeys,” Keating said. Email “Extra bus lanes for Dublin city as cars will be reduced to one lane on quays”. Feedback on “Extra bus lanes for Dublin city as cars will be reduced to one lane on quays”.